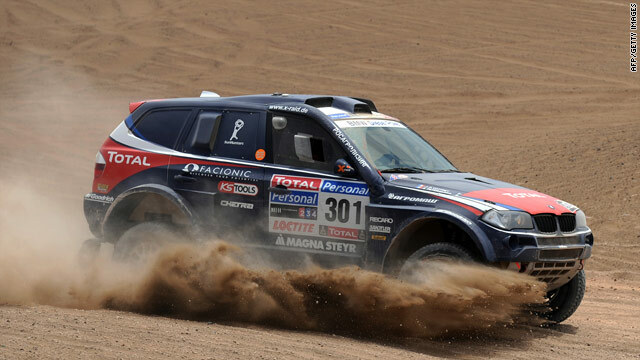 Frenchman Stephane Peterhansel claimed his 20th car win, and 53rd overall, in the sixth stage of the Dakar rally. (CNN) -- Stephane Peterhansel won the sixth stage of the Dakar Rally to record his 20th stage victory in the car class -- as Carlos Sainz extended his overall lead. Frenchman Peterhansel, whose BMW was delayed by transmission problems on Wednesday, passed 11 cars to finish the Antofagasta to Iquique run ahead of Sainz, with Wednesday winner, American Mark Miller, third. The victory was a record 53rd in all categories for Frenchman Peterhansel and moved him up to eighth overall, two hours, four minutes and two seconds behind the Volkswagen of Sainz. German manufacturer Volkswagen kept hold of the top three spots in the overall rankings with Nasser Al-Attiyah, who finished fourth on Thursday, in second place, 15 minutes and 24 seconds behind Sainz, and Miller in third. In the bike class, Italian rider Luca Manca suffered a serious fall 10 kilometers into the stage and was immediately taken to hospital. In a separate incident, Portugal's Paulo Goncalves (BMW) had to withdraw after a fall at 195km left him with a broken collarbone. The stage was won by Spain's Marc Coma, France's Cyril Despres retaining the overall bike lead.